Southpawian Fury: Happy Holidays from us and Hickory! Happy Holidays from us and Hickory! The above image was a drawing I whipped up for the Xmas cards Rod and I sent out this year. 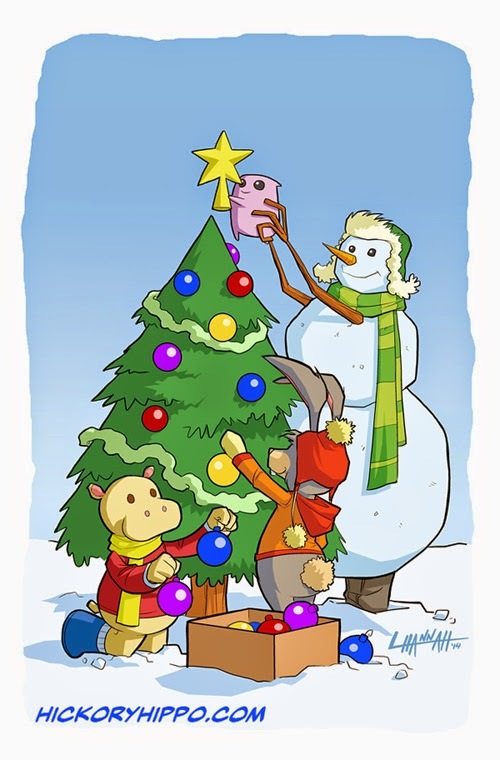 It features characters from our first children's storybook-- Hickory Hippo and the Snow Mystery! It features the adventures of Hickory, an inquisitive little hippo, and his animal friends. This has been a long time coming, and we're excited to finally be able to introduce it to the world! The first adventure is available right now in time to be a holiday gift for any little ones, friends or family in your life.